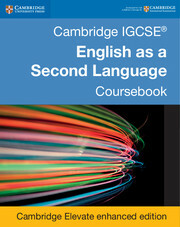 This fully updated print coursebook is designed to support students studying for Cambridge IGCSE® English as a Second Language syllabus (0510/0511/0991) for examination in 2019. 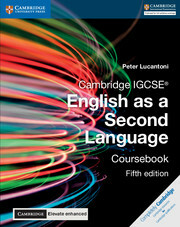 With carefully scaffolded content, this easy to navigate coursebook has a language focus in each unit and offers new word and top tips. Each unit is themed and takes an integrated skills approach while emphasising a core skill. 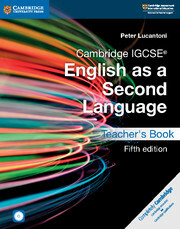 At the end of each chapter students can reflect and develop on what they have learnt, all to help build students' language skills and confidence in English as the course progresses. Answers in teacher's book. Exam-style questions are included in each unit, along with 'Top Tips' to help learners prepare for the Cambridge IGCSE® English as a Second Language examination. Video activities in every unit, plus four mock speaking exam videos. 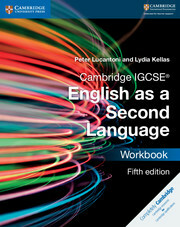 Language focus is included in every unit with 'Language Tips' drawing attention to common learner error. NEW 'Word Tip' feature is built in to help build students' vocabulary. More speaking and listening practice added with new units which focus on speaking.